Creative Weekly: Bow Wow arrested in Atlanta, Tekashi 6ix9ine snitches on fellow gang members, 21 Savage faces deportation and New England Patriots win their sixth Super Bowl. Bow Wow was arrested Saturday morning (Feb. 2) in Atlanta after allegedly getting into an altercation with a woman. TMZ reports Bow Wow and the woman named Leslie Holden had a dispute and when the police arrived, Bow claimed the woman assaulted him while the woman argued the same. According to police report obtained by WSB-TV , both parties “sustained visible minor injuries" and officers “were unable to determine the primary aggressor of the altercation, so both parties” were charged with battery. Bow Wow, whose real name is Shad Moss, is currently out of Fulton County jail were he was being detained after posting a $8,000 bond. His attorney, Joe. S. Habachy released a statement saying Bow Wow was wrongfully arrested after being "beaten by an out-of-control intoxicated female." Brooklyn rapper, Tekashi 6ix9ine has reportedly pleaded guilty to nine counts of racketeering, weapons and drug trafficking - TMZ reports. The 22-year old multi-coloured rapper who was arrested last year November reportedly copped a deal at a plea hearing last week and is reportedly cooperating with federal prosecutors. Tekashi, born - Daniel Hernandez - admitted at a court hearing in Manhattan on Jan. 23 to being a member of notorious New York gang, Nine Trey Gang Bloods, The New York Times reports. The Dummy Boy rapper admits to helping other gang members rob people at gun point as part of a pledge by new gang members. In one instance last March, 6ix9ine participated in the attempted murder of a rival gang member to increase his standing within Nine Trey. Nine Trey allegedly carried out armed robberies and shootings around New York city that targeted rival gangs and trafficked drugs such as heroin and fentanyl. It's unclear how his cooperation will affect his prison sentence but according to The New York Times, a prosecutor said Tekashi's cooperation was likely to reveal the criminal activities of other people and that he may eventually need to be placed in the witness protection program. If he cooperates successfully with the American government, he could face a maximum of 47 years in prison. Atlanta rapper 21 Savage was arrested by U.S. immigration and Customs Enforcement (ICE) on Sunday (Feb. 3) during a targeted operation. According to reports, 21 is a United Kingdom national who legally entered the U.S on a visa in July 2005 but failed to leave after his visa expired a year later. The I am > I Was rapper has been living in the U.S illegally for over 13 years. “U.S. Immigration and Customs Enforcement (ICE) arrested unlawfully present United Kingdom national Sha Yaa Bin Abraham-Joseph AKA ‘21 Savage’ during a targeted operation with federal and local law enforcement partners early Sunday in metro Atlanta.” ICE Spokesmen Bryan Cox said. “U.S. Immigration and Customs Enforcement (ICE) arrested unlawfully present United Kingdom national Sha Yaa Bin Abraham-Joseph AKA ’21 Savage’ during a targeted operation with federal and local law enforcement partners early Sunday in metro Atlanta. Mr. Abraham-Joseph was taken into ICE custody as he is unlawfully present in the U.S. and also a convicted felon." “Mr. Abraham-Joseph initially entered the U.S. legally in July 2005, but subsequently failed to depart under the terms of his nonimmigrant visa and he became unlawfully present in the U.S. when his visa expired in July 2006. In addition to being in violation of federal immigration law, Mr. Abraham-Joseph was convicted on felony drug charges in October 2014 in Fulton County, Georgia." 21's attorney released the following statement. "We are working diligently to get Mr. Abraham-Joseph out of detention while we work with the authorities to clear up any misunderstandings. Mr. Abraham-Joseph is a role model to the young people in this country, especially in Atlanta, Georgia, and is actively working in the community -leading programs to help underprivileged youths in financial literacy." 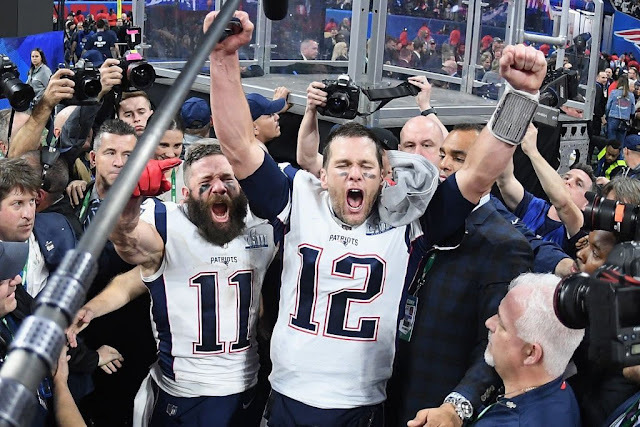 The outcome was never in doubt but many neutrals and Tom Brady haters alike hoped for something spectacular to happen, it never did as The New England Patriots deservedly win their sixth Lombardi trophy. The win makes Brady the oldest starting quarterback to ever win the Super Bowl, eclipsing Peyton Manning, who was 39 when he won Super Bowl L (50). Brady has also won more Super Bowls than any other player in history, surpassing Hall of Famer Charles Haley, who has five rings. Bill Belichick, at 66 is the most successful coach in Super Bowl history and the oldest man to win it. He joins George Halas and Curly Lambeau as the only NFL coaches with six championships since the league began postseason play in 1933. The Patriots pulled off a defensive masterclass to stifle a Rams offence that averaged 32.9 points per game in the regular season. 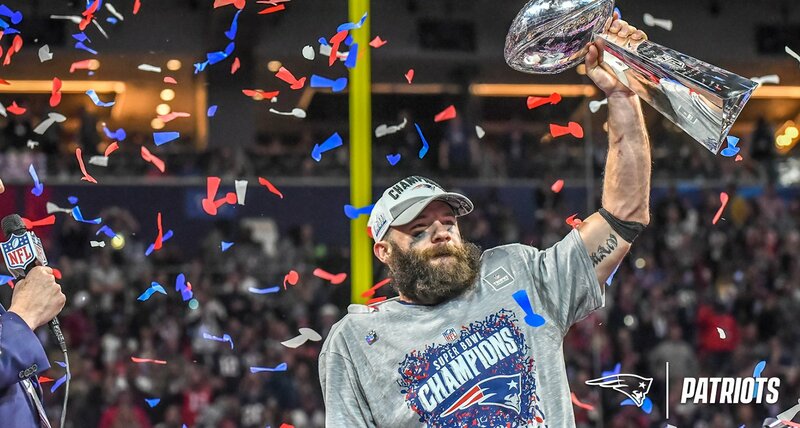 Pats wide receiver Julian Edelman was named the game's MVP, with 10 catches for 141 yards. Eight of Edelman's receptions led first-down pick-ups.